Justin Bieber | Block That! Veterans Need Jobs Too…Tim Knows All About It. I have a friend. His name is John. He has a friend named, Tim. This is Tim’s list, from John. Give this a read and start jamming on your resume. I’ve helped a couple people with their resumes and this is wonderful advice. Feel free to contact me if you need resume help. 1. It is ok to use a proper sentence. Stop writing your bullets to look like a fitness report. Bullets from your fitness report may contain some valuable information that you can use on your resume, but are not always structured properly. You do not need to speak in 3rd person. 3. The next section I jump to is “Education” on the bottom. I am looking for clues that lead me to believe you are capable of learning the job that I am going to hire for. What are your certifications? Can you work with Microsoft Office? Don’t just tell me you went to college. Do you know how to use any of the systems that we use? Help me out. 5. Spell out all acronyms! What does SNCOIC mean? Now that you told me it means Staff Non-Commissioned Officer in Charge I am still clueless. Translate to terms that I can understand. The rule above might help. Awarded a Navy and Marine Corps Accommodation Medal for meritorious service while serving as Utilities Chief in support of Operation Iraqi Freedom. 7. Your resume is the first thing I see. Make a good impression. The very next thing that I do, is look for you on Linkedin. I may even look for you on Facebook. I am looking for reasons not to hire you. 8. Submit a PDF copy of your resume. The format on your computer may look completely different on my computer if it is a word doc. When you submit a PDF I see the exact same thing you see. 9. Show your resume to lots of smart people. Get their professional input. Make sure you bring more than one copy with you. You will want to make notes on one and leave that smart person with the other. You never know what they will do with it. 10. Do not be lazy. Get it done! No one cares about you more than you! We all have them. We cherish some of them, we avoid others. We seek them, we seek to end them. I’ve been thinking, especially upon my return from Afghanistan about relationships. Here’s where I’m at. We are inherently consumers. We are wired to survive, we are wired to ensure we have what we need: emotionally, spiritually, physically, intellectually and we work hard to keep those at acceptable levels for our personalities, where we are in our lives and countless other factors. What is the protocol when relationships shift from high priority to a lesser priority? Still a priority, but less of one. What happens when you date someone, you make plans, you talk about everything and cocooned in your love pod; everything is perfect. Then reality happens. Reality has a way of being that shovel to the face or falling down some stairs you didn’t see. If you are in a relationship and reality hits; it takes a very astute partner to realize reality is lurking at the bottom of those stairs or winding that shovel up to clock you in the face. Their reflexes could be the difference between them having to get smelling salts to wake you up after you get thwacked or catching the shovel or pushing you out of the way so you don’t get hit. It’s a survival game. Because I’ve already covered this in subsequent posts, I won’t dwell on it. Instead, what happens to two people when one couldn’t prevent the other from getting smacked with the reality shovel? They part ways and their friendship is broken. The amount of care hasn’t changed. All of the initial reasons for a strong friendship are still present and some might argue due to the time spent cultivating the friendship, it’s ceased from being raw ore or a collection of similar elements and is now an alloy. I light, agile, strong compound able to withstand some pretty acute forces of reality. But, due to disagreements on how to temper the alloys; it’s been left in the vice. Files and tongs hang smartly on their hooks; no move to hone this alloy or shape it into anything more than it is. It’s a mass. A conglomeration of experiences, conversations, dreams and aspirations. When friendships dissolve they don’t really go anywhere, depending on the strength of the relationship. Ignoring the friendship doesn’t destroy the experiences. It doesn’t put the tears, long since wiped away, back on a streaked face. It doesn’t punch the teeth out of smiles, created through shared experiences. It doesn’t go back in time and erase shared glances, handshakes, hugs or kisses. It doesn’t somehow misplace the elation that comes from reunions after long periods of absence. It doesn’t make the warmest hugs, given in comfort, cold. All of those things happened. It will affect trust and I understand that. I’m not talking about infidelity in a relationship. I’m talking about someone who feels abandoned, who feels like they don’t have access to that person anymore. Trust is fixable if the life shared was truly shared. I would offer, casting aside an insurmountable investment into a friendship/relationship is waste. Reality has a harshness that changes things. A harshness that puts an edge on things. Based on reality people, places, things shift in their priority. Somethings will be the most important things in the universe…then reality happens, jobs happen, moves happen and the shift happens and reality hits you with a shovel. It doesn’t mean you aren’t important. It doesn’t mean there is any regret. It means; life. There are many ways to respond to this: Work harder! You’re always saying discipline is the answer to everything. Just work it out. This will likely be a series as I navigate through thoughts. Hate. We can disagree without it. There is a problem today. It’s a problem that’s been prevalent since the dawn of time: Hate. Hate is defined by Merriam/Webster as an intense hostility and aversion towards something usually deriving from fear, anger or sense of injury. I think ignorance should be inserted in there at some point. What is usually going on when the wrath of “hate” is incurred? Odds are nothing actually warranting a hateful response. Try again. Those are not things worth hating. Hate takes a lot out of a person if they are legitimately full of hate for something. Hate implies you are willing to go to great lengths to eradicate the thing you are directing, hate towards. You are not going to go to great lengths to wipe broccoli or traffic from existence. If you legitimately hated him; you would find away to kill him. Ignorance should be added to the spectrum of hate, because when you see or hear it used; it’s by lame-brains who use it in heinous ways, but never take action. Thereby neutering the word and minimizing the causes, however wrong of people who actually hate things. May we get a little hairy? Yeah. Put a race in there and feel your mind recoil in horror and the thought of you actually HATING those people. You hate those things, big guy? You hate them? Are you a big man? You gonna step up and support those claim, big dawg? I didn’t think so. You don’t have the resolve the people who really hate, have. Go back to any of the people, we find people hating. Then go find one and shoot them in the face. Remove the thing you hate. You hate it. Fix it. There are people out there who really hate. They hate and have hated black people enough to murder them. Jews have been on the receiving end of hate for generations. Hitler was serious about hate to the tune of 6 million murdered. Realize you are an ignorant person to exclaim your hate for people. Realize you aren’t allowed to hate people unless you’re willing to kill them. We’re to help people. We’re to care about people. It’s a classic scenario: you have a problem, find a solution. We can hate situations if we’re willing to fix them. We can hate behavior if we are willing to take steps to inform people and eradicate the behavior. But, we CANNOT hate people. 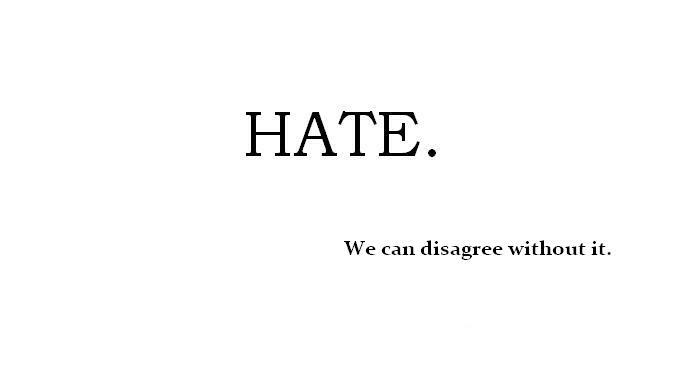 We can disagree without hate. I don’t agree with people who don’t take care of their families. I don’t hate them. I don’t agree with them. I don’t appreciate their actions. I don’t care about gay people. I’m completely neutral on the act of gayness. I disagree with things surrounding that topic, but I don’t hate gay people. I wish I could stop hearing about it…but I don’t hate them or it. We need to focus on the meanings of the words we use. Unless you are willing to go all the way…you don’t hate something. I’m going to come back around to this topic again…but I wanted to get this out there for now. I enjoy shooting. I enjoy owning guns. 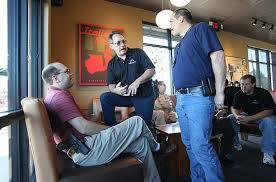 I respect people’s right to own, carry, brandish, shoot and collect guns. However, I’m starting to liken gun-stooges with Crossfit-stooges. Crossfitters are typically arrogant, loud, obnoxious fitness buffs who never shut-up about Crossfit. 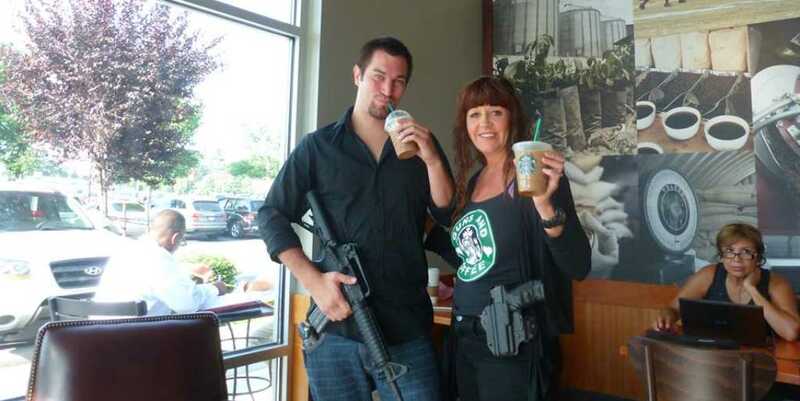 Gun-stooges are starting to do the same and this Starbucks situation gave them a wonderful opportunity to act the fool. This is not an unreasonable request. He acknowledged the right’s of Americans to tote around their registered firearms, but would prefer they not do it in his stores. This memorandum sent the gun-stooges into a frenzy and September 18th turned into “Everyone-bring-your-guns-of-every-kind-into-ALL-of-the-Starbucks”. I don’t understand why these people think their right to bear arms trumps Schultz’ right to ask people not to bring guns into his establishments. If any one of these gun-stooges asked you to refrain from cursing in their houses and every time you go for a visit you wear a shirt that says “F*ck *ff, D*ck Breath” and pepper the conversation with less than savory words, they would undoubtedly have a fit. Yet for some reason these gun-stooges feel that every aspect of life is made better by having iron strapped to yourself. I have seen multiple people posted all over Facebook wearing/posing with guns at their weddings, family portraits and/or just hanging out. Get a grip people. Srsly, a broomstick dramatically increases CQB accuracy when clearing rooms/buildings. Blogger’s Note: Found this little snippet this morning.I am loving how self-righteous society is about gun control, abortion, gay-rights, defense spending etc….yet children are being ignored while their parent crusade for these “hot-button” items, most of which have never directly affected any of them. For the love of God – Please make some time for your kids. Know who they know, know where they spend their time; both in reality and virtually. Members of the infamous message board 4chan allegedly pulled a dangerous prank on Justin Bieber fans on Monday, when they created the trending Twitter hashtag “#cuttingforbieber,” reportedly in an attempt to provoke fans to cut themselves in protest over Bieber’s alleged drug use. In a bid to “get some little girls to cut themselves” the Internet pranksters set about by creating fake Twitter accounts claiming to belong to teenage girls. Under those accounts, they then tweeted out pictures of cut wrists and wrote messages encouraging the Canadian-born pop star to stop using drugs so that they could stop harming themselves, reported Complex. It was unclear who among those sharing the gruesome photos with the #cuttingforbieber tag were legitimate Twitter users, however the images sparked an immediate wave of outrage throughout the social media site. Many began users parodying the self-harm images, tweeting out photos of themselves with scissors, cutting pieces of paper or scraps of cloth, or with ketchup smeared on their wrists as in a photo by user @Pseud_O-Nym. Those images seemed to fuel the indignation of many users, who felt that the trend was in bad taste and denigrating towards those genuinely suffering from self-abuse. 19 Days Till Christmas – A Gift List. According to a press release from Pizza Hut, in response to customers claiming to love pizza so much they want to smell like it – now they can…in Canada.